Joanne Tatham (vocals); Max Haymer (piano); Lyman Medeiros (bass); Dan Schnelle (drums); Kevin Winard (perc); Marcel Camargo (guitar - 3 tks); Larry Koonse (guitar - 1 tk); Brian Swartz (trumpet); Bob Sheppard (sax). Mark Winkler's Catch me if you Can highlights Haymer's piano – the ideal contrast to Tatham's flighty vocal. I certainly would have loved to have caught her! Phoebe Snow's Poetry Man, Bill Gable's Rings of Saturn and Todd Rundgren's Can We Still Be Friends? show that jazz singing doesn't have to depend on the good old GASbook although Love me or Leave me and It Could Happen to You which open and close the album are the perfect bookends. Few vocal albums escape an Antonio Carlos Jobim composition and I'm pleased to say that we have two here and that Tatham does them both justice - If You Never Come to me and Jazz 'n' Samba are the selections. For some unexplainable reason, the works of Stephen Sondheim are rarely part of the jazz canon which is a shame, listen to Tatham sing Anyone Can Whistle and you'll know what I mean. Nice to be Around by John and Paul Williams is another that hasn't been overworked. Swartz's trumpet adding to the emotive vocal. The two horns aren't heavily featured but when they are they add immeasurable colour and the rhythm section swings like crazy, to use a phrase from my dated vocabulary. 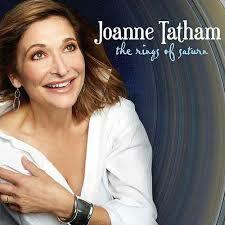 Joanne Tatham: The Rings of Saturn is available on Café Pacific Records.